His Royal Highness The Prince Philip, Duke of Edinburgh, Lord High Admiral of the United Kingdom (his full title is 136 words long) is the oldest-ever male member of the British Royal Family, as well as by far the longest-serving and oldest spouse of a reigning British monarch. After 66 years of marriage to the Queen (who calls him her ‘constant strength and guide’), he is so revered around the world that one community in the South Seas worships him as a god. Although his direct, no-nonsense approach to life has put many noses out of joint and frequently made headlines, his witticisms and occasional gaffes have helped to endear him to the British people almost as much as the Queen. 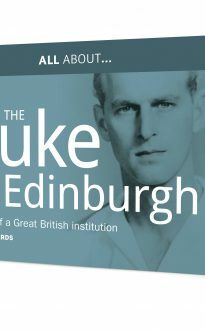 Learn all about the public and private Prince Philip in this fascinating book.